Through our new Theme Options, enjoy the unlimited possibilities that you’ll always desired, you’re free to express your own creativity. Quick and easy to use the most important thing for selling product on mobile. Ciao is fully responsive and very close to a native app. 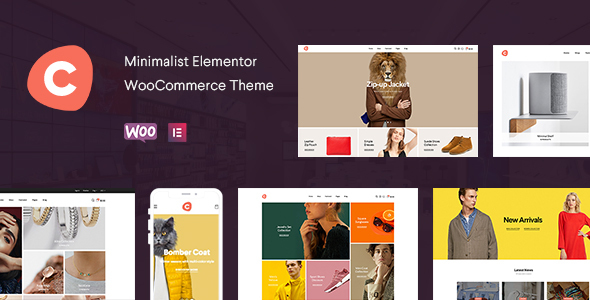 Ciao is the perfect theme for your shop or your clients websites as an agency or freelancer. Building anything with Drag & Drop page builder and large element library. You don’t need to buy any 3rd extension and spend extra budget. Our built-in mega menu feature gives you endless menu possibilities. A lot of settings and unique features will save your time. Fully automated One Click Demo Content Importer will recreate our demo website on your server in a minute. Now you have unlimited opportunities with our drag & drop header builder. Unlimited different possibilities to list your products. CleverLayredNavigation – WooCommerce Ajax Product Filter plugin included: Our built-in AJAX Product Filter functionality gives your customers a seamless user experience on both desktop and mobile devices. Conversion rate for your website will depend on product page view. We offer only trusted variants checked by our experience. Choice is on your side. CleverSwatches – WooCommerce Color or Image Variation Swatches plugin included: Convert your normal variable attribute dropdown select to nicely looking color or image select. CleverSwatches allows you to add multiple gallery images for each variation and when visitor selects the variation those gallery images will be shown as gallery images instead of main product gallery images. In our ecommerce experience, customers who are near the “free shipping” threshold will try to add more products to the cart to qualify for free shipping. 93% of people stated that a business offering some form of “free shipping” offer would encourage them to purchase more products from that retailer. It’s pure psychology. Your visitors would get the most relevant search results, and personalized product from the first character they type in the search box. Buy Now will smartly complete as many purchase steps as possible. Clicking on “Buy Now” button skips the cart and jumps to checkout. Sale your products over your Instagram Feed. Add more shoppable links by clicking on your Instagram Feed tab. Achieve faster loading and also less bandwidth by using power of adaptive image which re-scales your web page images automatically according to your visitor’s screen size appropriately. This theme is designed with terrific attention to performance and user experience. This theme is incredibly fast and powerful. Your website will be faster than 86% of all websites in the world! Multiple ways to express your thoughts via blog formats. Show the post in different ways by using blog layouts. PSD version is included when you purchase this theme. After purchase just contact us to get the downloadable link. Whether you’re a new or legacy user, our easy to navigate documentation will make your experience enjoyable.